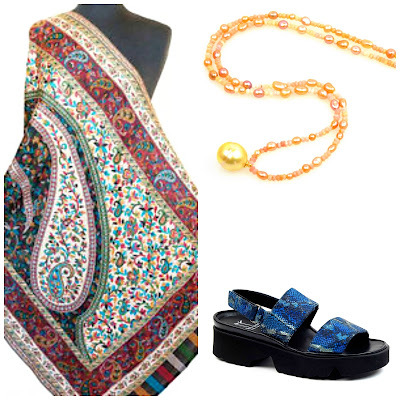 Note: Reader Paula wondered if she should buy Honora dyed red and denim-blue pearls. I don't recommend dyed pearls in unnatural colours. Skillful dying has its place when it makes, for example, a luminous grey from an unevenly coloured white, but the reds, lime greens, etc. are not what I'd choose. This post about choices in large-sized pearls may be helpful, Paula. My jeweler recently showed me a strand of white South Sea pearls she sold to a client for his gift to his wife, Beth. We cooed over the string of 12mm, perfectly-matched rounds, significant and luxe. Beth's husband paid $18,000–what I'd expect for AA+ South Seas. I'd love to wear such a strand, but might not retire the debt in my remaining lifetime. How to get lavish-sized pearls for less than the price of a car? A graduated strand is less of an investment and still delivers the South Sea thrill. 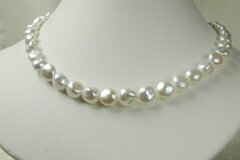 Shown above, an 18-inch strand of graduated whites, 12mm to 14.8mm, from Pearl Paradise; price, $11,000. Some women adore the glamour of South Seas, and desire nothing else. To find SS strands below five figures, get on a flight to Manila but be prepared to spend at least $7,000-$8,000 with a reputable seller. 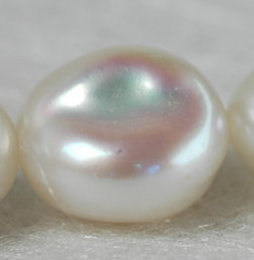 (Many strands sold as "baby South Sea" are in fact freshwater pearls imported from China.) Sometimes I've seen SS necklaces at auction around $4500-$6000, but don't forget the auction house premium and taxes. 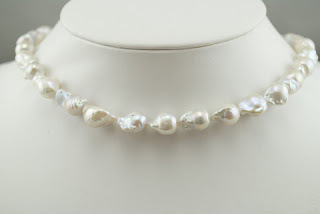 Since I firmly believe that a grown woman's pearls should be at least 9mm, let's look at some Chinese freshwater pearls (CFW) varieties, alluring when the pearls have thick nacre and very good lustre. Above, Chinese white 9mm baroques from Kojima Company, a far funkier pearl than Beth's, compatible with a more casual lifestyle. Well-matched, with glowing luster. Price, $72 for the temporarily-strung 16-inch strand; add about $50-$125 for stringing and a clasp, price will vary depending on clasp you choose. Stringing adds one to one and a half inches. Something new: the soufflé pearl, a Chinese variety introduced in the past two years. Instead of a bead or tissue nucleus, the pearl is cultured with some kind of organic material. When the pearl is drilled, this 'mud' exits, leaving a very large (13-17mm) baroque pearl with metallic lustre. The durable, light pearl is a boon for women who find a large pearl necklace too heavy. These are hard to find; Pearl Paradise cannot guarantee supply after current stock is sold. The 18-inch multicolour strand shown is $600 (includes standard clasp). Pearl Paradise also offer a white soufflé strand; price, $1,100 and a pink and lavender strand ($1,300) that practically glows in the dark. These are Chinese 10-11mm keshis, in a plump shape called "pillows". Solid nacre, with a smooth surface and occasional dimples, from Pacific Pearls. Price (temporarily strung), $130. Look at the overtones! The closeup shows what's so wonderful about keshis (also spelled keishi). If you've just got to have rounds, I understand; they are classic, serene, impeccable. Pearl Paradise's Freshadama pearls are a smart choice. These are pearls to sigh for, an example of the quality now possible in Chinese product; the 18-inch 9mm-9.5mm white strand is $1,130. (Also available in multicolour, $980.) I prefer them to Japanese akoyas, about five times the price. Paula is interested in colour, so I wanted to show this 18-inch necklace of 9.5mm-10mm multicoloured rounds, on sale at Pearls of Joy; price, $424! White, lavender and pink/peach, all natural colours. With a 90-day full return policy, perhaps a Valentine to yourself? 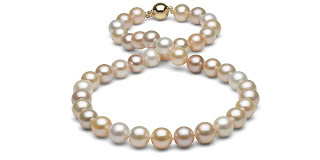 Your smaller pearls can enjoy a happy new life mixed with new pearls to make a rope, strung with other beads or converted to a bracelet–but at this point, when buying new pearls, choose a size to match your magnificence and experience. And for you Tahitian lovers, I'll post a two-part series on Tahitians in a few weeks. I never did quite get what all the fuss was about pearls. Until I saw these beautiful white SS pearls. Wow! Perfection! I'm still too young and about $ 18,000 short to be sporting these but this post has inspired me to keep my mind open and maybe one day I'll be able to afford at least a pair of earrings. Duchesse, I knew you'd knock it out of the park on this topic. I've become very fond of irregular pearls, and WOW those souffles and keshis are gorgeous! Forgive me, but - why? coffeeaddict: Appreciation for any gem is often linked to quality. If you only "get" South Seas, I hope you will have an opportunity to see fine CFWs, Akoyas and Tahitians. So many pearls in mainstream jewelers are boring, with no overtones and poor nacre. Pseu: Why, thank you. The soufflés are tempting to me, too. roseblight: Because smaller than 8mm reads as girlish; I far prefer 9mm and up. Pearl prices (excepting South Seas and some very fine Tahitians and Akoyas) make larger sizes affordable. Like coffeeaddict I didn't get the fuss about pearls when I was younger, but I realize now that I just wasn't interested in small chaste pearls. I'd love big rounds but can't afford that price tag, and smaller rounds don't interest me. Irregular pearls, interesting colors, and more interesting strand are much more appealing. Those keshis are gorgeous and I've been drooling over the souffle pearls, wishing there was some way I could rationalize the purchase. I love pearls, I have pearls, I wear pearls. But bigger than 8mm feels like too much as I am not a terribly tall person, and already broad-shouldered. But some pink keishis would be very nice:). Oooh! I like the naturally colored pearls. Those have me intrigued. I have shied away from wearing pearls as I have always thought they aged me. But I'm starting to think that a lovely pair, worn sans earrings, would make a sophisticated 50th birthday present for myself next month. I have new, shorter, bouncier haircut and one lovely piece around my neck would be a perfect, lush yet minimalist frame for my face. Mardel: CFW rounds that I've shown are perhaps affordable though once you get above 11.5mm you are pushing the envelope on size available in Chinese pearls. A woman who wants 15mm rounds is buying South Sea and Tahitians. Jean S: If they are doing good business (ads do not necessarily mean that) it is because buyers are taken with getting so much for so little. Except they are not. I saw that ad, no thank you! laurieann: It's the "chaste" (as Mardel called them) 6-7mm baby teeth pearls that are aging, as they evoke a girlish stage that has departed. Even 8mm is rather unprepossessing. A strand of pearls with presence is not aging, it's elegant. Oh thank you, Duchesse. I just love love love your posts about pearls. Delicious. Thanks for this delightful post. I have pearl lust after reading this post. I had never associated irregular pearl shape as being more casual, but of course, they are. Thank you for making this observation as I can now happily hunt for pearls that will work for my casual lifestyle. Thank you for this introduction into pearls! I feel very flattered that you took your time and answered my question in an posting. Keishi is very good-looking to me. The "imperfect shape" (hope I get this term right) is appealing. The next time I visit Tokyo, I need to go INSIDE the Mikimoto buidling (last time I only took photos of the huge christmas tree in front of the building). You surely read about Jackie's fake pearls, sold for thousands of $. She wore the fake pearls back when she was the 1st lady, what makes me think fake is ok, too. Are pearls the new black? Swarovski (known for crystal) started with pearls. And women around 40, too. 106-0032. Always good to make an appointment first, and in doing so, no obligation to buy. Pearl prices have come way, way down since the days of Mrs Kennedy's fakes. Jackie Kennedy had various pearl necklaces, many genuine. The fakes were a bit of theatre; the general population likes a touch of "real folks". Mrs Kennedy had stunning fine jewelry, which she wore more often than fake pearls. I do not advocate wearing fake pearls unless you want a frankly funky/fun style that simply does not exist in genuine pearls or are traveling and don't want to risk loss. Some people claim their fake pearls are indistinguishable from real but 97% of the time, it is only b/c people who do not know what a real pearl looks like have told them so. But the main reason is, fakes have no soul! Real pearls are now within reach of any women who can afford a pair of mid-priced shoes or a good bag. Fuji: Irregular shapes always read as more casual but you can wear a strand of 9mm baroques with a dress or suit, too. South Seas are ballgown pearls. Thank you for the another wonderful pearl post. On your recommendation, I reseached and purcased a strand of blue akoyas around the holidays. They suit my taste which tends toward the "strict" or classic but still they look fresh. I would love to see what you would recommend for summer, not necessarily pearls, but maybe. Coral interests me as does light shades of blue lapis, glass or sea glass. I think I can find turquoise on my own or perhaps "light, airy pearl pendants. Summer is still a long, long time away here in New England but I need to look forward to it just now! Anon J.: Delighted to hear about your blues! If you look under the jewelry label, you will find posts on citrine, topaz, peridots- especially lovely in summer. I of course wear pearls then, see pearl post on March 18, 2010, "Pearls for the first spring days". See also "Great whites for Ruth" on Sept. 23, 2010. A SS pendant like the one shown would be a great summer look. I really wished I had you with me when I was in the Philippines last September as I had no idea which were the good pearls and which weren't, so I didn't buy any! Imogen: Anyone traveling to a pearl area can research by reading (there is a lot on the net) or of course e-mail me. 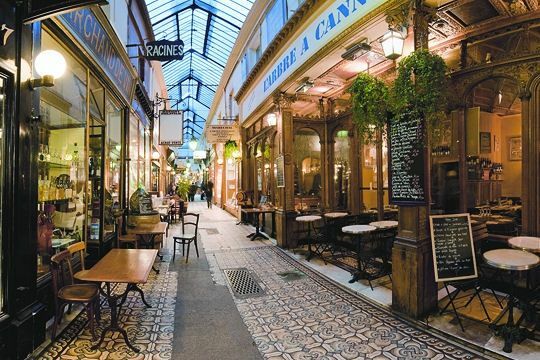 I've helped several friends traveling there; even a single pearl is the best souvenir! Jill Ann: I think some women worry about precisely this, that pearls make them look too girlish, too "jeune file". That is only when the pearl is too small or too tight (many of our necks are, ah, fleshier as we age). That's why I say, go to 9mm and up. And this young woman sounds very polished. There is a way to wear pearls at any age. Jill Ann: Sorry for typos, that is "jeune fille". Thank you for your fabulous post. On your recommendation I purchased a bullet pearl strand from Kojima Pearl. They are just lovely and much admired. I had them restrung but had trouble sourcing a suitable clasp. Any tips for clasps would be appreciated. I live in Australia and recently purchased from Freshwater pearls. Was very disappointed as the pearls looked like beads and I returned them. Best wishes. Anonymous: See www.ninadesigns.com for a variety of clasps. So happy you like the Kojima pearls! Do you know Catherine Cardellini? 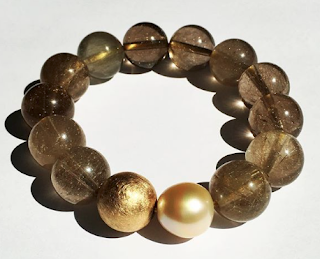 (www.catherinecardellinipearls.com)? She is in Australia. I prefer knotted- she uses mostly spacer beads-but you could restring her pearls too. May I ask if there are rules regarding the lengths of the pearl strand? I have a longer neck, broad shoulders and small chest. I am also petite 5’4” What pearl strand length would be more flattering for me? To summarize my question: how to buy it once and buy it right so that there is no need to upgrade it again in the future? Thank you very much. Russian Chic: Do you know about "pearl shrink"? it is like diamond shrink, you think it is SO big when you buy it and a few years later, it looks so much smaller. That is one reason I advise 9mm and up. With your longer neck and definite shoulders, you could carry 9mm but if you prefer 8.5, by all means buy what you are comfortable with. baroque, oval, drop or off-rounds look more casual than perfect rounds. Earrings: same size as the strand or slightly larger. You're right to want to do it once and enjoy your choice. Check the return policy; the vendors I feature have good ones so if you decide on another length you can exchange for a period of several months! They will also talk with you before you order- as should ANY vendor. But at the same time, don't be too worried as most choices are not irreversible- you can restring too short lengths with other beads or make a bracelet from a too-long rope. Finally, make sure the clasp is one you like, and solid. Some clasps have tiny additional security clasps for extra "insurance". I appreciate your taking time to respond to all my questions. Thank you very much.